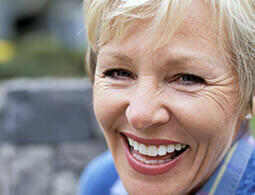 In the past, the best solution for replacing more than one missing tooth was a partial or full denture. Over time, a denture that fit properly begins to feel loose because it only replaces missing teeth not the supportive root structure. As a result, denture patients only enjoy partial functionality. With implant-supported dentures, it’s possible for patients to achieve even better results. Implant-supported dentures look great and allow patients to enjoy improved functionality because implants are designed to replace the supportive root structure and tooth. While a single implant supports one replacement tooth, multiple implants are required for a partial or full denture. These implants are placed surgically. Following the placement procedure, a process known as osseointegration occurs. During osseointegration, the implants bond to the jawbone mimicking the relationship between natural tooth roots and jaw. Once the placement procedure and osseointegration stages have completed, Dr. Grossman attaches a custom-made prosthetic to the implants. A partial denture replaces a few missing teeth while a full denture replaces an entire row of upper or lower tooth. Would you like to learn more about implant-supported dentures or find out if this service is right for you? Call our Acton office to reserve your consultation. As an experienced periodontist and implant dentist, Dr. Stephen Grossman is delighted to offer exceptional care to patients from Concord, Westford, and beyond.